TOPEKA — Green Team volunteers from Westar Energy invite youth age 12-17 to participate in their annual spring turkey hunt, April 1-14, 2015, at Jeffrey Energy Center (seven miles north of St. Marys). Hunts will take place primarily in the mornings and on weekends, but weekdays and afternoons are possible based on volunteer guide availability. Registration will be open through Friday, March 20, or until all slots are filled. Applications will be accepted on a first-come, first-served basis with preference for inexperienced mentors. Contact Barb Cornelius at (785) 575-8125 to apply. Youth must be accompanied by an adult, preferably one who does not have turkey hunting experience. These trips will take place in enclosed blinds around small crop fields scattered through the plant’s property, where turkeys are abundant. No special clothing, calls or decoys are needed, however hunters must bring a shotgun. Hunters 15 years and younger will need to purchase a youth spring turkey permit. 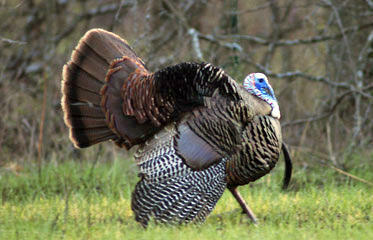 Hunters 16 years and older must have a hunting license or apprentice hunting license, as well as a Unit 3 Turkey Permit. To purchase a license or permit online, visit ksoutdoors.com/License-Permits. The Westar Energy Green Team is made up of employees and retiree volunteers who take on environmental projects across Kansas. The group completes between 50 and 70 projects per year on weekends and evenings. The Green Team also collaborates with conservation groups, agencies and schools in enhancing and fostering an understanding of the Kansas environment.